What is a country song without some great acoustic guitar in the mix? There are a number of country songs that include great acoustic guitar sounds. 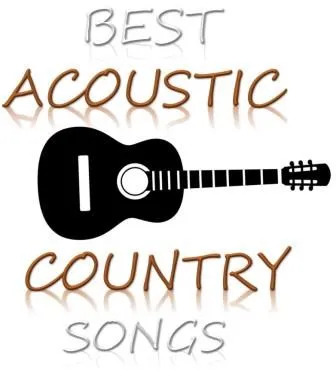 I have curated this list of the top ten best country acoustic guitar songs of all time. So if your looking for some great country songs on acoustic guitar to learn, or to just listen to, you have found the right spot! O.k. here’s my top 10 – hope you enjoy! This is an oldie but a goodie for sure! Brown eyed girl has the perfect mix of upbeat acoustic guitar sounds and vocals that really capture an audience. Van Morrison has described his idea for this song to be more of a Jamaican vibe so using the acoustic guitar was a genius way to create this illusion, while also keeping the song light and fun. Everybody knows this classic country song, which is one reason why it is making my list for the top ten best country acoustic guitar songs. It is a great, well known song with simple acoustic beats that can be easily learned when practiced enough times. Sweet Home Alabama combines a southern country charm, with acoustic greatness to create this ever so popular song choice. What kind of top 10 list would this be if I didn’t include a little Johnny Cash? Ring of Fire was released in 1963 gaining Johnny a spot in the Grammy Hall of Fame. The repetitive beat and rhythm of the chords make this an excellent choice for beginners looking to better their acoustic guitar skills. Shania Twain has a great record of success when it comes to the country music scene, she has sold more than 100 million records making her the best selling female country singer of all time. All of her songs deserve the proper recognition however, You’re Still the One stands out to me as one of the best songs using the acoustic guitar. Taylor Swift has done her fair share of acoustic guitar songs when it comes to her country successes. One of the best acoustic guitar songs that really stands out to me from Taylor is Back to December. This song is soft, slow and uses easy to follow chords and tones for someone trying to learn the acoustic guitar. Keith Urban is an all time fan favorite when it comes to the country realm and it just wouldn’t be right to not include him on my list. One of my favorite songs from Keith Urban is the relatively new release that has a smooth, Jazzy feel and will make anyone want to curl up and snuggle a loved one. Blue Ain’t your Color is the perfect acoustic song to use when learning the basics. Dolly Parton has a way of really capturing her audiences with not only her spectacular voice, but also the catchy songs that she releases. Jolene is one my favorites because it includes a lot of acoustics that would make it great for anyone trying to learn to play the song. As usual, The Beatles never fail to make the list when it comes to top performances and audio tracks. Written by George Harrison, this is one of the most popular songs released by The Beatles in the 1960’s. Here Comes the Sun is a great choice for this acoustic guitar country songs list because, it implements all aspects of the acoustic guitar making it really shine for the country music lover. Burning House comes from the album Untamed released by Cam in 2015. The reason I chose this song as number 2 is due to its quaint demeanor, and the usage of the acoustic guitar is so perfect that it really does give the song a certain point of serenity and peace. The song is brilliantly written, and for learning on the acoustic guitar, I believe this would be an excellent selection. No list would be complete without some Chris Stapleton – and this is appropriate as my number 1 pick. This live version of What Are You Listening To is the perfect example of Chris’ classic country style that evokes all the emotions that you ever expect from acoustic country music. This song is also one that’s nice and east to learn on acoustic guitar and one that you can have a great time singing along with. So that’s my top 10 country acoustic songs. What would you have in there? Anything that stands out from this list to you? Anything that you think doesn’t belong? Just leave a comment in the comments section below.